Karst is a geological condition that develops when underground soluble rocks (limestone, dolomite, gypsum, anhydrite and halite--salt) are dissolved away by water. At the surface, karstlands typically have little or no surface runoff after rainstorms because the rainwater quickly percolates downward through sinkholes, disappearing streams and arroyos, and perforated surface rock (caprock). Most water movement takes place underground through enlarged fractures, channels and caverns in the dissolved rock. The water finally emerges to the surface again at a few large springs. The WIPP site lies near Carlsbad, New Mexico in the northern Delaware Basin, part of a larger basin system formed when much of the Southwest was covered by an inland sea. The edge of the Delaware Basin is defined by an ancient reef, the Capitan Limestone (or Capitan Reef). This area, part of the Pecos River Valley, is one of the largest karstlands in the United States. Within one mile of WIPP and to the west lies Nash Draw, one of the largest surface karst features in the world. Many other karst features are also evident at WIPP. Extending into the southwestern part of the WIPP site is a karst valley 1 mile long. Curved around the northeast corner of the site and including borehole WIPP-14, are a chain of about 10 closed depressions; and south of the site is a vast karst area near the dune field at Mills Ranch. Sinkholes can be seen clearly just south of the WIPP boundary where one of the groundwater flow paths turns westward. West of the site there is another chain of sinkholes, including borehole WIPP-33, leading to Nash Draw. Knowing whether karst features are present at the WIPP site is important because water can move much faster through these channels and conduits where the salt has been dissolved away. If karst conditions do exist at WIPP itself and radionuclides leak out of the repository and reach the karst channels, travel times for these contaminants to be carried offsite or even into the Pecos River could be dramatically shortened. Instead of taking thousands of years to reach the river, it could take just over 100 years. Radionuclides and hazardous chemicals could reach a water, oil or gas well within 2 miles of the site in as little as 15 years. WIPP scientists and other, independent, scientists disagree about where exactly significant dissolution (dissolving away) of salts in the water-bearing Rustler Formation begins (more on individual formations below). DOE scientists draw the dissolution edge between Nash Draw and the WIPP site. Others, however, have found evidence for karst and rapid water flow across the WIPP site itself. (During the Hazardous Waste Facility Permit hearings, DOE scientist Dr. Dennis Powers couldn't name a single scientist who supported DOE's theories, who didin't work for DOE.) 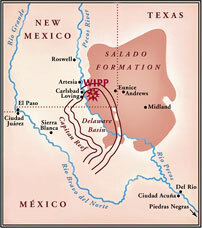 DOE's own 1976 Resistivity Survey concluded that there was a dissolution front on top of the Salado Formation that extended into the WIPP site. Since much of the evidence points to karstic channels and features in the Magenta Dolomite and other formations that DOE has not adequately tested, DOE doesn't have enough data to say truly where this dissolution line lies. DOE cannot even say for sure where the water table lies (although it is believed to be in the Dewey Lake Redbeds), and doesn't have enough data on most of the formations above WIPP to model whether or not they are viable pathways for contaminants to leave the repository. Discharge/recharge patterns (how the water comes into the aquifers and where it leaves the system) of the Rustler Formation are unknown. Although it is generally agreed that water from the Culebra probably discharges into the Pecos River, "...flow direction, vertical seepage, karst [and] present-day recharge..." are not well understood.EEG 61: Review of the WIPP Draft Application to Show Compliance with EPA Transuranic Waste Disposal Standards) Because of this lack of information, it is impossible to tell whether it will take 100 or 1000 years for contamination from the site to reach the Pecos River (and from there, the Rio Grande and water supplies for millions of homes, ranches and farms). It is disappointing, to say the least, that after more than 20 years of investigation DOE scientists still have such a poor understanding of the site. At WIPP the caprock is the Mescalero Caliche Formation which is covered by windblown sand. This formation is no barrier to water movement since up to 15% of it has been dissolved away, leaving the sand in direct contact with the fractured sandstone below. Caliche is essentially limestone and can be dissolved. Breaches are also caused by taproots or fractures. The result is a perforated caprock that funnels water into the karst formations below. The karst valley at WIPP noted above, consists of solution-subsidence troughs formed when surface rocks collapsed into underground caverns. In some parts of the valley there are conduits or solution pipes through the caliche. In other places the caliche is mostly gone leaving only remnants or a powdery residue (dissolution residue). After heavy rainstorms, water runs along the surface until it finds a breach in the caliche and disappears below. The Santa Rosa Sandstone pinches out south and west of the WIPP shafts. DOE has claimed that groundwater in the Santa Rosa is isolated, discontinuous or perched (a perched aquifer is water that collects or ponds above localized areas where the rock is impenetrable and prevents downward flow) and that there is "little or no water" in this formation. In fact, water has shown up in this formation within 215 feet of the WIPP Exhaust Shaft. Unfortunately, DOE has not collected enough data to know whether or not this formation is a potential migration pathway for contaminants. 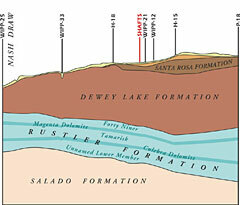 A water-saturated layer or horizon was found in the lower Santa Rosa/Upper Dewey Lake Redbeds Formations. This horizon is at the same depth where water has been flowing into the Exhaust Shaft. DOE has claimed that this water is either the result of condensation from the ventilation system (even though their own investigation said this was unlikely) or recharge from ponds constructed on the surface. 1997 studies reported that this area was saturated with water over more than 80 acres, however, which makes recent recharge from these ponds an unlikely source. Again, not enough data has been collected to definitively describe the source of this Exhaust Shaft water. The upper part of the Dewey Lake Redbeds consists of open fractures filled with water. About 170 feet below the surface most fractures are filled with gypsum. (see photo at left) This doesn't mean that the Dewey Lake is impenetrable, however. There are feeder channels in this formation near the waste panels that transmit water from the surface down to the Rustler Formation below. Water has been found in this formation at 9 locations within the WIPP site including the shafts themselves and in 6 other locations within 3 miles of the site boundary. These locations are clustered in the south-central part of the site and south of the site where the Rustler Formation water is freshest and the Santa Rosa Formation is absent. This data indicates that the recharge area for the Dewey Lake Redbeds and the Rustler Formation is in the south-central part of the site and south of the site--everywhere that the Santa Rosa Formation is not present. Again, DOE has not collected enough data to model the Dewey Lake Redbeds as a migration pathway.